Tag clouds are a mechanism for showing a list of topics/categories along with their relative frequencies of occurrence. This can useful for finding content on blogs, news sites, discussion boards, information systems and more. They can be textual or graphical, although the latter gives much greater flexibility and is the focus of this article. 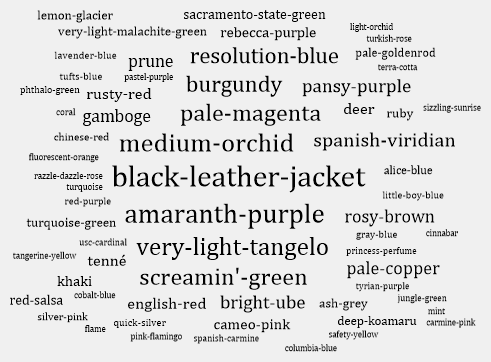 Much thought can be given to the layout of a tag cloud. You will notice that the default WordPress tag cloud used on this blog simply lists the tags in alphabetical order and uses progressively larger font sizes to denote the more frequently-used ones. More sophisticated layouts try to position the most frequently-used tags in the center, with the least-used being furthest away. I have even explored force-directed algorithms for this purpose, although I later concluded that they were not well-suited to the problem. The solution I ultimately adopted takes an iterative approach and uses fitness criteria to arrive at an optimal layout. It places each tag on the diagram in order from highest to lowest frequency. The position of a tag is determined only by the tags which preceded it. Starting at the center and working outwards, a position is chosen such that the tag does not collide with any previously-placed tag. Several criteria are used to compute the fitness of the solution if the tag were to remain at that position. This process is repeated for all directions (360 degrees). Each time a more optimal solution is found, the tag is moved to that position. When all angles have been exhausted, the tag will be at its most optimal position and control moves to the next tag. Sort the collection of tags by frequency in descending order. Let totalBounds represent the used bounds of the tag cloud, and be initialised at zero. Let bestBounds represent the bounds of the most optimal solution so far, and be initialised at zero. Let bestDist represent the distance from the center of the tag cloud for the most optimal solution, and be initialised at zero. Let tagBounds represent the bounds (position and size) of tag, and be initialised at the center of the tag cloud. Let tagDist represent the distance from the center of the tag cloud, and be initialised at zero. Move tagBounds to a point tagDist units from the center of the tag cloud at angle. Check whether tagBounds collides (intersects) with the bounds of any tags previously placed. If there are collisions, increment tagDist. Otherwise, exit the loop. Set bestBounds to (totalBounds ∪ tagBounds). Move tag to the location of bestBounds. My implementation of the algorithm above takes the form of a C# class named TagCloud, which represents a tag cloud and offers methods to apply the layout and render to a screen or bitmap. Included is the ability to specify basic visual properties such as the font face, colour and style, as well as the gradient between the font size of the tags with the highest and lowest frequencies. I also provided a way to favour a particular aspect ratio (as not everyone wants a perfectly square tag cloud), although it should be noted that the aspect ratio of the final tag cloud will fall somewhere between the desired value and 1:1 (square). Tags are represented by the TagItem class, which encapsulates the name and frequency. They are added to an order-unimportant collection, to be sorted during the layout process. After calling the Arrange() method, the tag cloud can be rendered to a GDI+ Graphics object representing the screen, a bitmap or a printer. The Draw() method accepts a target rectangle within which the tag cloud will be automatically scaled and centered. To facilitate interactivity, a HitTest() method is also provided to determine the tag at the specified coordinates. 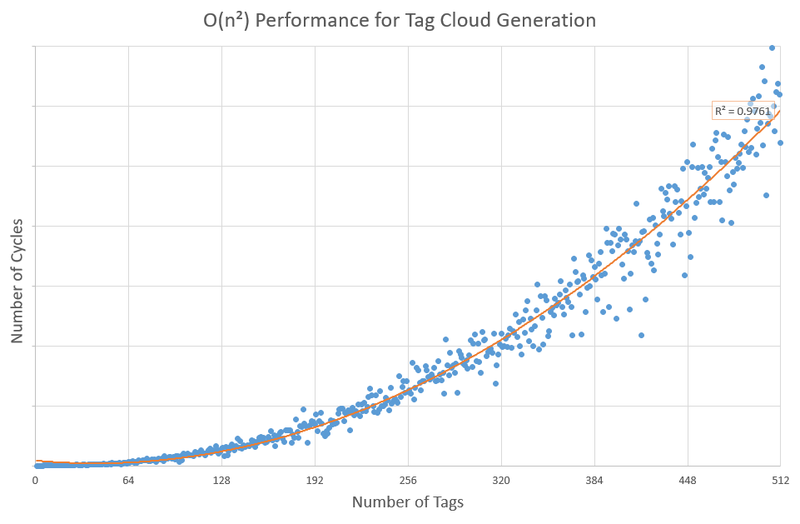 Tags with the highest frequency occupy the center of the cloud as intended, and tend to stack vertically at first (as this fits the criteria for “squareness”). Subsequent tags occupy the surrounding space and progressively move outward from the center as intended. Shorter and lower-frequency tags sometimes fill in gaps between larger tags. This happens more as the difference in font size between the tags becomes more extreme. Performance begins to degrade beyond about 128 tags. This seems acceptable when you consider how readability decreases as the number of tags increases. The distribution of the tag frequencies affects the performance of the layout algorithm. When randomly generated using a normal distribution, it runs slower than a more typical distribution (where a few tags dominate and there are many tags with a very low frequency). The source and binaries for this project are available on GitHub. This implementation produces good results with reasonably good performance. I see potential for further optimisation (being able to achieve O(n log n) performance would be highly desirable!) and additional features, such as being able to vary text colour and other visual properties on a per-tag basis. Drop-down controls are most commonly employed when the user is required to make a single choice from a discrete list of items. It does not matter whether the items are static or dynamic, however good UI design dictates that the list of choices should not be too long. Requiring users to scroll through large drop-down lists is slow and inefficient, so a search facility is often provided in this scenario. However, search functionality can add complexity to the UI and disrupt its flow (especially if the search opens in a separate window). In order to develop a better solution for long lists of choices where a discrete selection must be made, I decided to extend my earlier ComboTreeBox control to support searching. These changes were, by and large, trivial. All were implemented with the aim of leaving the default behaviour of the ComboTreeBox control unchanged. Since the DropDownControlBase class directly derives from the Windows Forms Control class (not TextBoxBase or ListControl), it does not have access to any built-in support for text input. Since we only intend to capture a short search term entered by the user, our requirements for text input are very basic. I created a reusable TextServices class to allow this basic functionality to be added to any control, regardless of its base class. It handles mouse and keyboard events in a pass-through fashion, manipulating an internal StringBuilder instance that represents the single line of text in the control. It is initialised with a reference to the control upon which it operates and a callback method which provides the bounds of the text box (in the case of our control, this is the bounds of the control excluding the drop-down button). Text input can be toggled using the Begin() and End() methods. The control initially contains some nodes. This may only be a subset of the total number of choices (e.g. the most recently/frequently used). Opening the drop-down, clicking within the bounds of the text box or typing into the control while it has input focus will replace the caption on the control with a blinking caret, and start accepting text input. If no text has been entered, the initial drop-down items will continue to be displayed. If the length of the string is between 1 and (MinSearchTermLength - 1) characters, the drop-down will display a message inviting the user to complete their search term. Once the minimum length has been satisfied – and for each subsequent change to the string – the control will invoke the PerformSearch event in a separate thread. If a search is already in progress, it will first be cancelled through the CancellationToken. If the search runs to completion, nodes representing the results are added to drop-down. The drop-down now contains only the items that matched the search term. The control will now behave as normal, until the user re-enters “search mode”. Since the drop-down displays different sets of nodes depending on the state of the control, the searchable drop-down control adds NormalNodes and AllNormalNodes properties to keep track of the nodes which are initially displayed (mirroring Nodes and AllNodes on the base class). If the PerformSearch event is not handled or overridden, the default logic is to perform a linear search on the initial nodes in the drop-down, using case-insensitive matching on the nodes’ Text property. Normally, however, you would handle this event and substitute your own search logic (e.g. querying an SQL database, calling a web service, reading from a stream, etc). It is not necessary to handle or override the CommitSearch event unless you need to differentiate between nodes with identical values for the Name or Text properties, although it may be more elegant to test for equality using a unique key of some sort. Being derived from ComboTreeBox, the searchable drop-down control supports both flat and hierarchical data, however for simplicity’s sake it is recommended that search results do not contain nested nodes. You can exclude nodes from the search by setting their Selectable property to false; likewise, you can include informational nodes in the search results that cannot be selected. You can use the built-in search functionality of the DropDownSearchBox control simply by adding it to a form and populating it with nodes (as you would a ComboTreeBox). Try typing into the editable part of the control; the nodes will be filtered according to the search term you enter. Visit my Drop-Down Controls project page to download the source and binaries for the DropDownSearchBox control. In an earlier article, I developed a set of managed wrapper classes for the Text Object Model (TOM); the API that underpins the RichEdit/RichTextBox control and provides an object model that is document-centric (rather than selection-centric, like the controls themselves). With it, you can efficiently manipulate rich text and, using the managed classes, do so from within a C# (or other .NET) project. The TOM 2 functionality is exposed by a set of COM interfaces that extend the original Text Object Model interfaces; for example, ITextDocument2 extends ITextDocument, ITextRange2 extends ITextRange, etc. For my managed wrappers, I decided that each of the existing classes should encapsulate the functionality of both interfaces; attempting to access unsupported functionality will result in an exception. Adding a SupportedVersion property allows the caller to check for feature support and gracefully degrade. The TOM 2 interfaces include some methods that replace methods from the original interfaces; e.g. GetDuplicate2. In the case of these, the wrapper class provides a single managed method that checks which interface is implemented, and then calls the appropriate native method. Also as before, all TOM classes implement IDisposable to allow unmanaged resources to be released when they are no longer required. 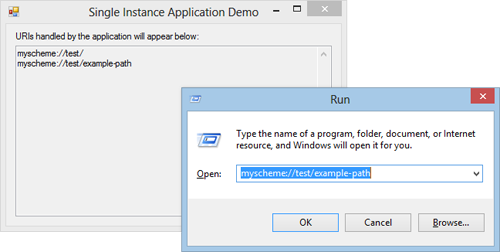 An instance of the ITextDocument2 interface must be obtained from a RichEdit control; however, the Windows Forms RichTextBox control loads version 2.0 of the RichEdit control and does not support TOM 2, even on Windows 8. Basic TOM 2 functionality is provided by version 4.1 of the control, located in MSFTEDIT.DLL (which ships with Windows). Full TOM 2 functionality requires the RichEdit control that ships with Office 2013, so called “RichEdit 8” (the window class name is actually RICHEDIT60W). In doing so, the platform of the calling process must match that of the DLL being loaded; e.g. a 64-bit application must load the DLL from the 64-bit version of Office. One of the key areas of functionality offered by TOM 2 concerns math text. The most notable feature is being able to convert a linear-form equation (i.e. consisting of a string of Unicode characters, or other text which can be interpreted by the TOM engine) into a built-up form (i.e. consisting of inline math objects, with full formatting) – and back again. These transformations are applied using the BuildUpMath and Linearize methods. A range of enumeration values/flags control this process. Also included is the ability to “fold” complex alphabetic characters into their plain text equivalents (using the new version of the GetText method). Office MathML (OMML) – Math RTF and OMML are very similar; the conversion parses the RTF and makes the necessary transformations to produce the XML output. W3C MathML (MML) – The conversion leverages the XSL stylesheet included with Microsoft Office which translates OMML into MML. My implementation also contains some extension methods which allow TextRange objects to be used like the familiar StringBuilder class; i.e. Append, AppendLine, Insert and Remove. You can download the latest version of my TOM Classes for .NET from the project page.